Have you ever tried Sopa de Queso from Nicaragua? Or Lablabi Soup from Iraq? Or Bean Cake from Burkina Faso? The one thing they all have in common is they are really cheap to make, yet nourishing. They are also among the featured suggested recipes this year for CRS Rice Bowl, the Lenten initiative of Catholic Relief Services that raises funds to support hunger alleviation projects mostly in the poorest countries of the world, and by the way provide a little help on the home front also. One quarter of the funds raised go to assist home-grown hunger — in Philadelphia’s case it is through archdiocesan Nutritional Development Services (NDS). It all started in the Allentown Diocese in 1975 when Msgr. 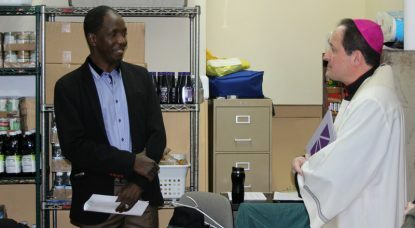 Robert Coll (St. Charles Seminary Class of ’59) along with some ecumenical partners got the idea of a very simple family meal weekly during Lent with the savings placed in a bowl to be donated to relieving hunger in the poorest counties of the world. That was not long after the strict rules of daily fast and abstinence from meat and meat products by Catholics on certain days were mostly abolished. This was fasting not for the sake of fasting, but fasting for a cause. The Catholic bishops picked up on it the following year and now it is practiced in many if not most dioceses annually. Under this plan 75 percent of the money raised goes to feeding the poor abroad and 25 percent stays in the local diocese for similar causes. In the Archdiocese of Philadelphia the program kicked off this year with a Rice Bowl blessing by Bishop John McIntyre on Feb. 2 at the Food Cupboard of St. Ignatius of Loyola Parish in West Philadelphia. 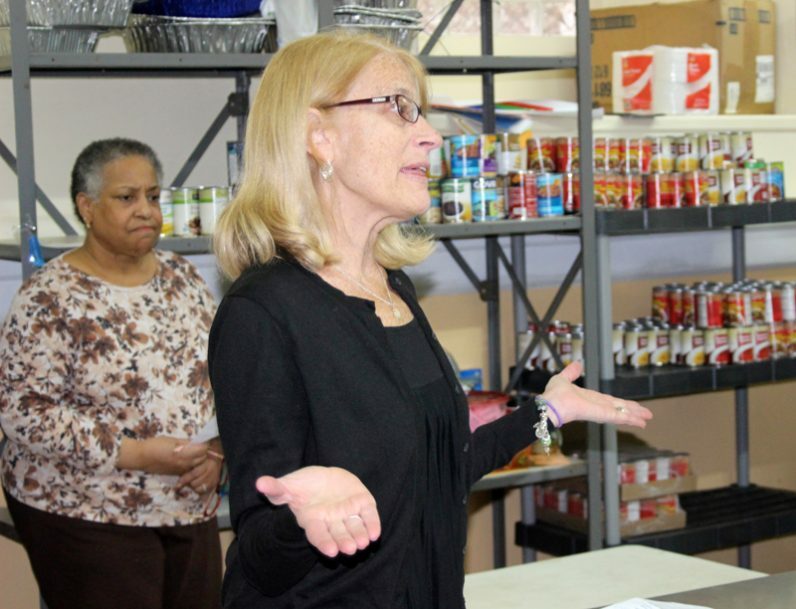 The food pantry, which is located in the church basement, helps people from all walks of life, explained Gloria Ayers, the food cupboard coordinator. 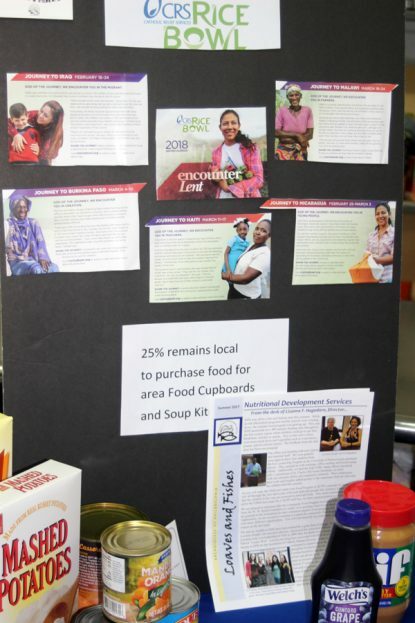 While she was aware of the food her pantry receives from Nutritional Development Services and she herself contributes to the Rice Bowl campaign, she had not connected the dots. Food cupboards, including those run by parishes such as St. Ignatius, depend in a large way on local donations, usually in the form of nonperishable staples. What NDS does in addition to contributing staples is also to supply such items as fresh fruits and vegetables. At this time NDS is assisting roughly 50 food cupboards along with their other local outreach programs. This particular event was “an opportunity to think about people who are not in our community but in the world community,” said Lizanne Hagedorn, executive director of NDS. Also present to testify on the work of CRS abroad was Jacques Kabore, a coordinator for CRS in Burkina Faso, which is among the poorest countries not only in Africa but in the entire world. Among others present for the blessing ceremony were James Amato, the archdiocesan Secretary for Catholic Human Services, and Jeff Wallace of CRS, who works with CRS Rice Bowl in dioceses in Pennsylvania and New Jersey including Philadelphia, which he said was among the most generous. Also present were Denise Hopkins, who currently administers the Community Food Program for the archdiocese; Anne Healy Ayella, who coordinates CRS activities in the archdiocese and was part of Rice Bowl at NDS virtually from its foundation. Finally there were the usually unsung volunteers who assist at the St. Ignatius cupboard month in and month out. Don’t forget to pick up your Rice Bowl at your parish this Lenten season. As a bonus, you can learn more about Rice Bowl through the CRS Solidarity Tour featuring this month a visit by Thomas Awiapo, a CRS worker and native of Ghana. He will share his inspiring story and the gratitude of all those supported by Rice Bowl participants on Tuesday, Feb. 20 from 7 to 8:30 p.m. at St. Charles Borromeo Seminary’s Vianney Auditorium. Operation Rice Bowl is a meaningful initiative.